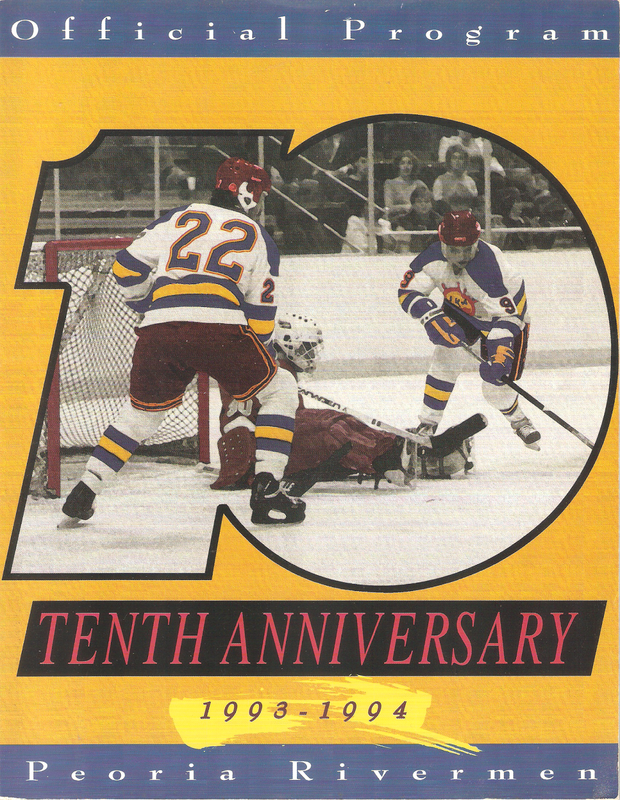 As you can tell by the programa cover, the Peoria Rivermen were in their tenth season of existence. The franchise originally started in 1983 as the Peoria Prancers, but changed their names after two lackluster seasons and new ownership. The Rivermen were the primary affiliate of the St. Louis Blues and played their home games at the 9,315-seat Peoria Civic Center. Long-time NHL forward Paul MacLean was behind the bench for the 1993-94 season. The Rivermen were coming off a last-place finish in the Midwest Division (third place out of three teams, actually) in 1992-93. This year would be different, as they jumped to first place, with a 51-24-6 record. Their 108 points just barely edged out second-place Cincinnati and was only seven points behind league-best Las Vegas. MacLean's squad scored the fourth-most goals in the IHL that year, piling up 327 goals. They were led by Doug Evans, who scored 27 goals and 90 points. Tony Hrkac led the team in goals with an even thirty, while three others scored at least 20. Peoria used four different goaltenders that year. Leading the way between the pipes was Geoff Sargent, who went 25-9-2 with a 2.45 GAA and 2 shutouts in 41 games. His main backup was Parris Duffus, who sported a 19-10-3 record with a 4.58 GAA. David Goverde and Nick Vitucci also saw action in the Rivermen net. As a team, Peoria allowed 294 goals. Peoria drew the defending Turner Cup Champion Fort Wayne Komets in Round One of the 1994 Turner Cup Playoffs. The Komets finished the season at 41-29-11--not an easy opponent. In the best-of-seven series, Fort Wayne downed the Rivermen in six. The Komets would go on to lose in the Turner Cup Finals to the Atlanta Knights in six games. Very nice program, comparable to the Vipers programs I own. The picture on the front is a picture of the team's first goal from a game against the Flint Generals. As for the program, it's 96 pages long, all on glossy paper and mostly black-and-white. The front office and coaching staff each have their own bios, as do the players. There's a section about the Peoria Rivermen Hall of Fame as well as a preview of the 1993-94 Blues season. Local advertisements include Hunt's Family Restaurant, WTAZ "Talk Radio 102", Illinois State Redbirds basketball and Mulligan's Irish Pub and Grill. 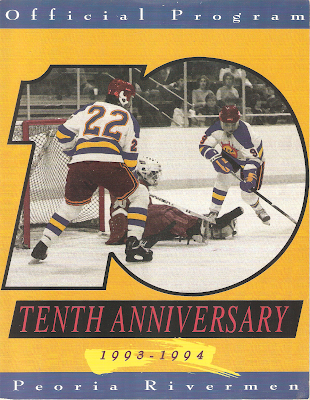 Aftermath: The Rivermen would exist through the 1995-96 season. The franchise then relocated to San Antonio, Texas, and were renamed the San Antonio Dragons, who lasted just two seasons before folding. A new Rivermen team played in the ECHL from 1996-2005, then were part of the AHL from 2005-13. That franchise then relocated to Utica, New York, for the 2013-14 season. Peoria is now home to a third Rivermen franchise, this time in the Single-A Southern Professional Hockey League.